Mariner Cruises has been offering Nova Scotia whale watching and birding tours off Brier Island, in the Bay of Fundy since 1994. 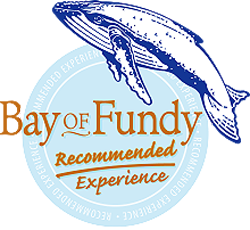 We invite you to join us for an exciting sea adventure from the Whale Watching Capital of Nova Scotia! Finback whales, minke whales and harbour porpoises are the first to arrive in the spring. In June, the humpbacks begin to return; by late June they are abundant, and Atlantic white-sided dolphins are often seen. Come explore Brier Island and the magnificent Bay of Fundy, home to inspiring marine life, rare bird species and the friendliest people you can meet. All tours are narrated by local naturalists, who are well-versed in the dozens of marine mammals and bird species that visit this important ecological region. Their friendly commentary and information exchange with passengers is well-known, and one of the many reasons outdoor enthusiasts choose Mariner Cruises Whale & Seabird Tours.